To equalize tread wear, it is recommended that the tires be rotated every 7,500 miles (12,000 km) or sooner if irregular wear develops. During rotation, check the tires for correct balance. When rotating tires, check for uneven wear and damage. Abnormal wear is usually caused by incorrect tire pressure, improper wheel alignment, outof- balance wheels, severe braking or severe cornering. Look for bumps or bulges in the tread or side of tire. Replace the tire if you find either of these conditions. Replace the tire if fabric or cord is visible. After rotation, be sure to bring the front and rear tire pressures to specification and check lug nut tightness. Refer to “Tire and wheels” in section 8. Disc brake pads should be inspected for wear whenever tires are rotated. 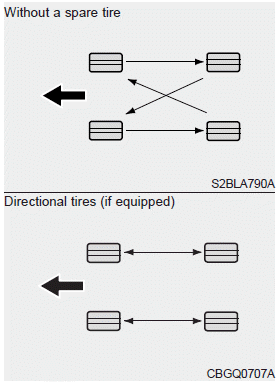 Rotate radial tires that have an asymmetric tread pattern only from front to rear and not from right to left. Do not use the compact spare tire (if equipped) for tire rotation. Do not mix bias ply and radial ply tires under any circumstances. This may cause unusual handling characteristics.